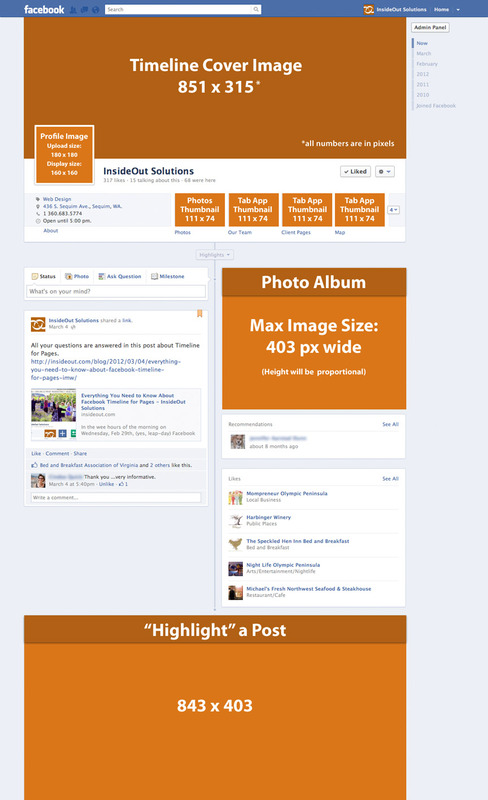 Facebook Timeline Image Dimensions Cheat Sheet - InsideOut Solutions, Inc. Your Facebook Fan Page is due for a conversion to the new Timeline format, and ready or not, it is set to happen on March 30th. If you manage a Fan page, you’ve no doubt taken the time to tour the new interface in advance of the conversion. With the myriad incarnations that Facebook Fan pages have undergone in the last two years, Timeline is the most radical. No other iteration has given the feel of a website quite like Timeline, with its large, single “cover” (or banner) image, and two column layout. Here we offer those of you comfortable with image editing software a great sheet of the image dimensions you need to really craft a customized page. The sheet works for everyone so you know just how Facebook is resizing your images as well.